This one includes tomatoes and probably green chilis, and was served on a bun with funky pink and green candied fruit. 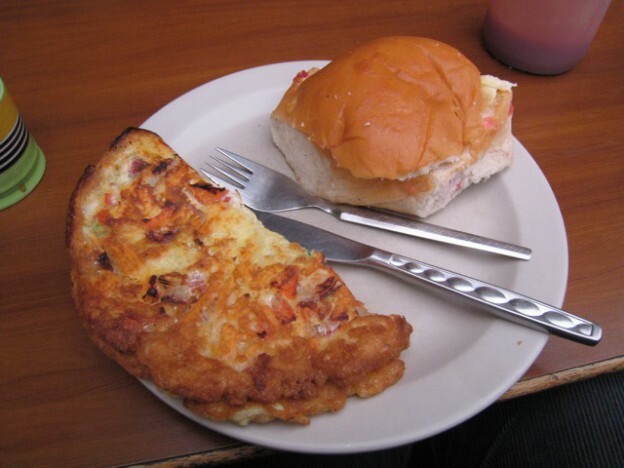 when cooked, fold in half and serve alongside bun as shown above or (better) fold into quarters and serve ON bun. Bun should be toasted in the same pan so it gets nice and greasy. Have sweet, milky tea with it. In case you’re wondering: cheese noodles is Ramen or Wai Wai noodles with cheese stirred in so it melts while the broth is good and hot. 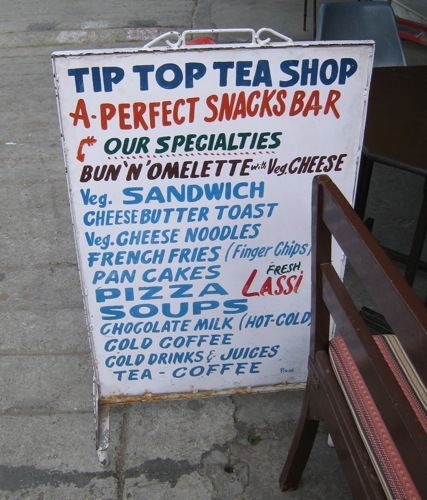 This entry was posted in travel in India and tagged food, India, Indian food, Mussoorie, recipes, travel in India, Woodstock School on July 31, 2009 by Deirdre Straughan. Last day of shopping in Delhi, Ross and I still had presents to buy, and it had been impossible to get the neo-graduates out of bed at a reasonable hour. So we found ourselves facing a line of state emporiums that were mostly closed for lunch. After a few minutes’ glance around one or two that were still open, we decided to head to Connaught Place to find some lunch for ourselves. We struck it lucky: right on the corner was Rajdhani Thali, which looked clean and appealing, and proved to be very good. It’s a set meal (which I suppose varies with the day and season), at a fixed lunchtime price of Rs. 168 (about $4) each. After you sit down, a man comes around with a ewer and washbasin so you can wash your hands (because you’re going to be eating with them!). 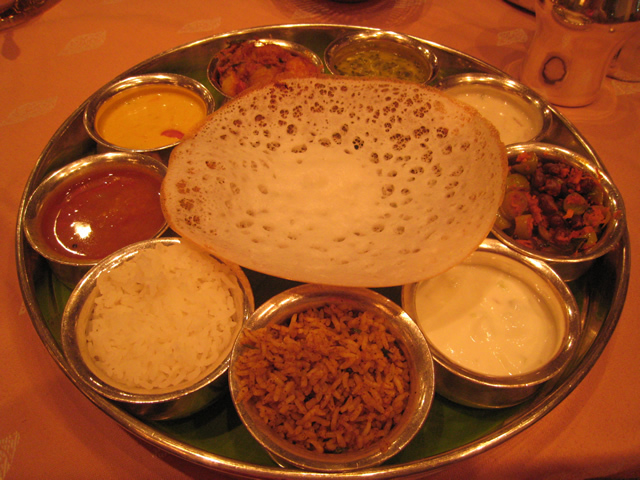 Then the thali – a big, stainless-steel tray – is brought out, empty, with some empty little bowls which are soon filled up by waiters making constant rounds. And they just keep coming, offering various dishes, seconds of whatever you want, and a variety of Indian breads fresh off the griddle. The style is Gujarathi and Rajasthani, not too spicy for most Western palates. I had no idea what most of it was, but it was all delicious (and strictly vegetarian). As is usual for Indian restaurants, service was excellent. Rajdhani Thali is a chain throughout India (and in Dubai). Highly recommended, wherever you happen to find one! 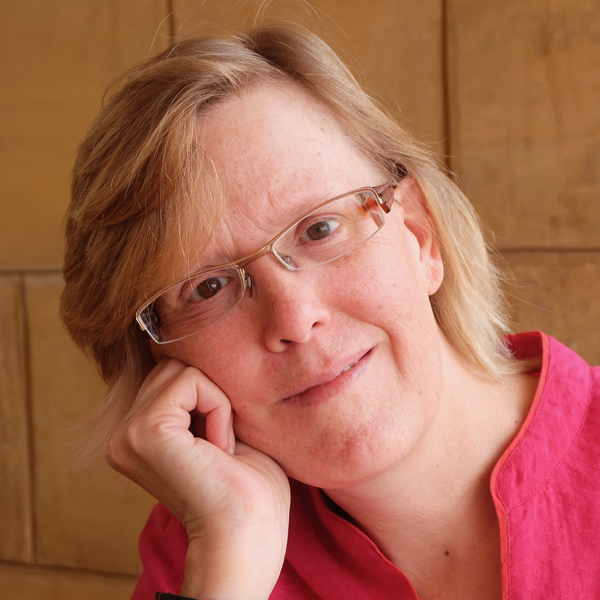 This entry was posted in India and tagged Indian food, Indian restaurants on June 10, 2008 by Deirdre Straughan. ^ above: a selection of chutneys (coconut, tomato, coriander, ?) with crunchy fried things to dip in them. Delicious as these are, don’t fill up – there’s a lot more food coming! While in Delhi I spent a morning working at Sun’s office, which is such a hive of activity that desks are at a premium! Then Ritu, a colleague, accompanied Ross and me to lunch at Dakshin, a restaurant in the Marriott Hotel in the Saket area of south Delhi. Dakshin means “south” in Hindi, and the restaurant features premium versions of the foods of south India, in a beautiful setting with excellent service. 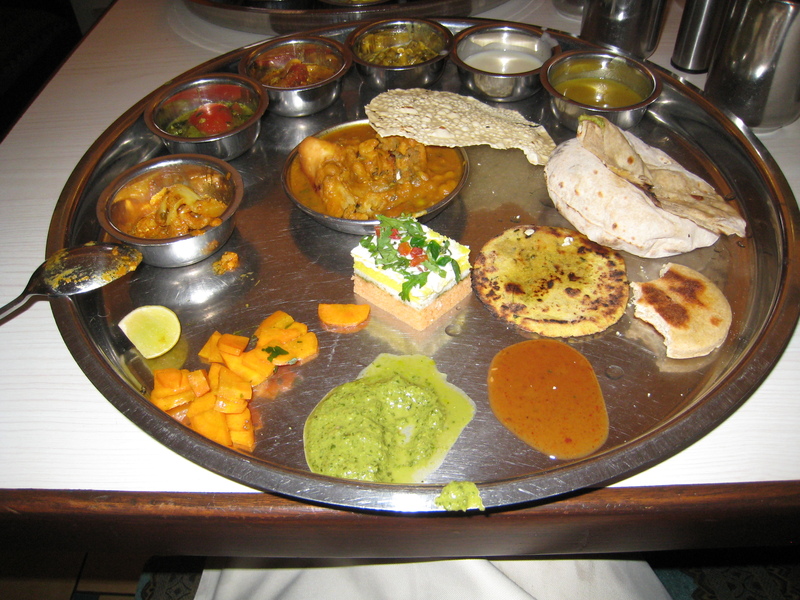 We ordered the vegetarian thali, a traditional Indian style of meal which works very well as a tasting menu. 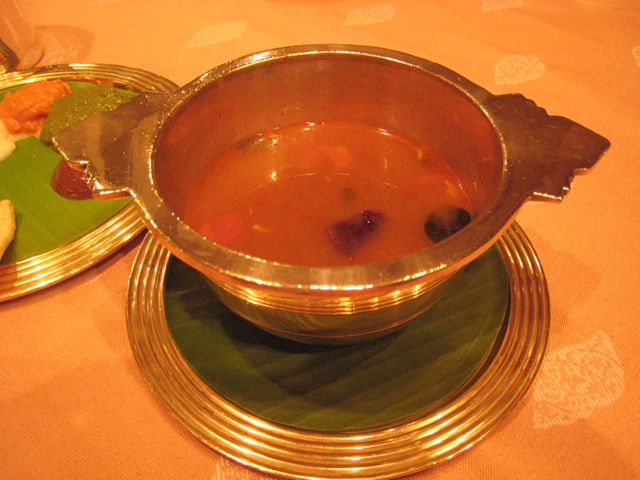 This began with rasam, a traditional accompaniment to every south Indian meal: a thin, spicy soup served (in this case) in gorgeous heavy brass bowls. I don’t have a lot of experience with south Indian food, but this was the best rasam I’ve yet tasted – a rich, aromatic broth, probably less hot than real south Indian norms in deference to the tastes of foreigners (and, for that matter, north Indians – real southern cooking is too spicy for many north Indians). After that the main meal arrived: the thali is the large, round tray, in this case with a banana leaf perfectly cut to fit inside, with little bowls of goodies arranged around the rim. From bottom center, going clockwise: tamarind rice, plain rice, lentils, a curry made from gram flour and coconut milk, potatoes, dal (lentils) with spinach, coconut curry with vegetables, something veggie which I couldn’t identify but liked, raita (yogurt). 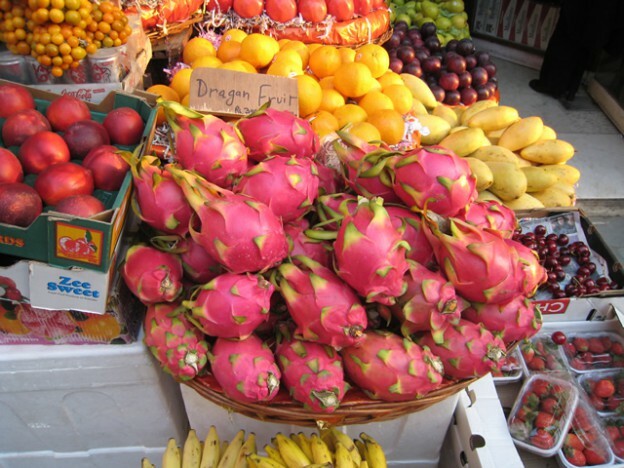 This menu will change according to season and what the chef finds in the market that day. In other thalis, you might leave the space at the center free for a mound of rice, so that you have room to mix it with the dal and other goodies. In this case, the center is occupied by appam, a bread made from rice flour and coconut milk – spongy on one side, crispy on the other, light, fluffy, delicately flavored, and thoroughly yummy! 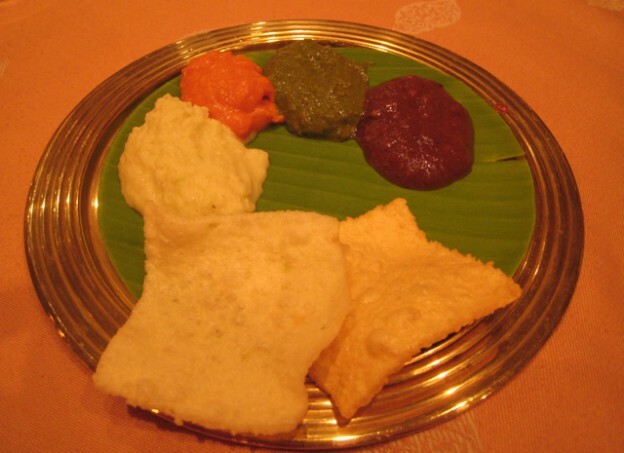 South Indian cuisine features many variations on breads made from rice flour, such as dosa and idli. All in all a very wonderful meal, even though Rs. 1000 or so per head is extravagant by local standards – prices have gone up shockingly in Delhi, especially against the weak dollar. 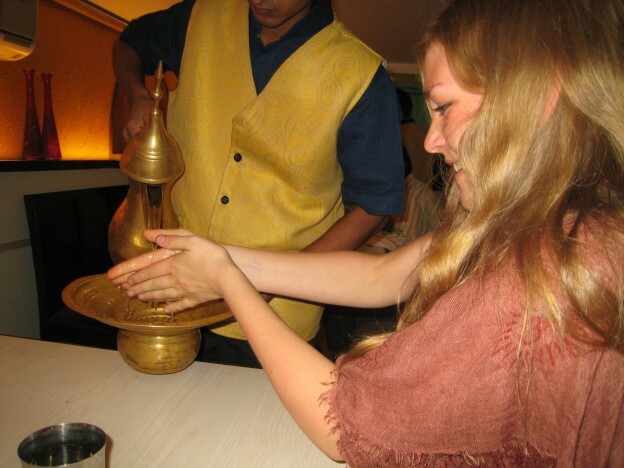 This entry was posted in travel in India and tagged Indian food, restaurants on December 23, 2007 by Deirdre Straughan.